We’ll continue to see increasing clouds tonight ahead of the rain coming in for Saturday. 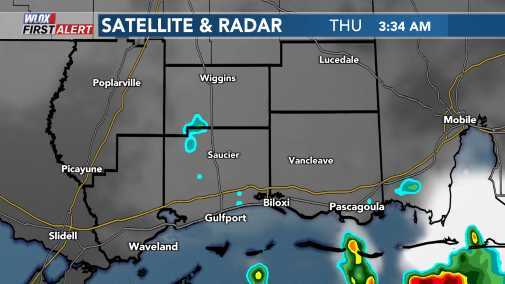 Overnight, scattered rain showers will start in parts of South Mississippi. Saturday will be a messy and wet day. We will keep a chance for rain in the forecast all day. Around noon, we expect more coverage, and after 3 pm, we expect heavier rain as the low moves over South Mississippi. We could see up to three inches of rain across South Mississippi on Saturday. As a result flash-flooding could be a threat if all that rain falls in a short time-frame which is why there is a Flash Flood Watch in effect through 6 pm Saturday. Severe weather is not expected, most will see heavy rain with a few seeing lightning. We may see a few light, lingering rain showers early on Sunday, It will also be mostly cloudy and little cooler with a northwest wind. The weather for the Mississippi Gulf Coast Marathon and Half Marathon will be pretty good running weather. We’ll be cooler and drier next Monday through Wednesday. Another front will approach bring rain chances for Thursday and Friday.